Use of Cortec® MCI®-2005 Admixture Raises Seawall Service Life Prediction to 150+ Years! A new reinforced concrete seawall off the Gulf Coast of Florida is predicted to last more than 150 years, thanks to a high density concrete mix enhanced with Migrating Corrosion Inhibitor™ admixture MCI®-2005. The owner of the structure had future generations in mind as he planned the construction of a new residence on the shore of Longboat Key. A seawall was needed to protect the shoreline from erosion, and the owner requested that the mix be designed with a minimum service life of 100 years. This extremely high structural standard is difficult to achieve in normal circumstances, let alone a corrosive subtropical seaside environment, where the reinforced concrete would be constantly exposed to high-chloride seawater. However, the owner was confident that this high standard could be achieved by using MCI®-2005 to help extend the service life of the seawall. Technology generally consists of two functional components: contact inhibitors and volatile corrosion inhibitors, some of which are amino carboxylates. They are nitrite-free and effective at very low doses. MCI® Technology works by forming a protective molecular layer on steel surfaces embedded in the concrete. One part of the MCI® molecule has affinity to metal and adsorbs on the metal surface. Another part of the molecule forms a hydrophobic layer that repels water and other corrosive species, thereby functioning as a barrier layer. The presence of MCI® significantly slows corrosion rates, extending the time to corrosion initiation and reducing corrosion rates once started. This increases the service life of the concrete structure. 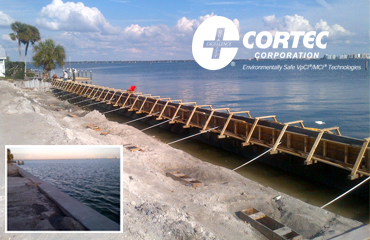 MCI®-2005, the admixture of choice for the Longboat Key seawall, was ideal for use in the marine-environment structure because of its UL certification to meet ANSI/NSF Standard 61 for use in structures containing potable water. Unlike traditional calcium nitrite admixtures, it is not highly water-soluble and is much less likely to leach into the seawater. MCI®-2005 also contains 67% USDA certified biobased content and qualifies to earn credit toward LEED certification, making it a highly desirable option for environmental considerations. In order to predict the service life of the new seawall and choose the best concrete mix, various mix designs were entered into LIFE-365, an independent service life prediction modeling software used by structural design consultants. When the initially proposed standard mix design for seawalls was entered into LIFE-365, it yielded a service life prediction of 15.2 years until the first repair would be needed (based on mix components and the marine environment). This fell far short of the property owner’s wishes. Adding MCI®-2005 into the mix design tripled the predicted service life of the original mix to 46.9 years until the first needed repair. Though this was a very positive result, the property owner’s high expectations drove the search for alternative mix designs that were proposed and run through LIFE-365. One of these mixtures was a high-density concrete mix the ready-mix supplier had previously used with the Florida DOT. By reducing the water/cement ratio and adding pozzolans, the mix brought the service life prediction up to more than 100 years. With the addition of MCI®-2005 into this particular LIFE-365 model, the service life prediction increased to more than 150 years, satisfying the property owner’s desire for durability and far exceeding original expectations. concrete seawall nearby. Because of the admixture’s use in a project well within a 500 mile (805 km) radius of manufacturing, MCI®-2005 will help qualify the building project to earn LEED credits if desired. The structure was built in Fall 2017, and according to service life prediction modeling should not require normal concrete repairs until well beyond the year 2167, allowing the property owner’s family to enjoy the protection of a sustainable seawall for many generations.